Analysis: Is Hun Sen is a good leader? បទ​វិភាគ៖ តើ​លោក ហ៊ុន សែន ជា​មេដឹកនាំ​ល្អ​ឬ​ជា​មេ​គ្រួសារ​ល្អ? លោក​នាយករដ្ឋមន្ត្រី ហ៊ុន សែន (ឆ្វេង) និង​កូន​ប្រុស លោក ហ៊ុន ម៉ាណែត។ លោក ហ៊ុន ម៉ាណែត កាល​ពី​ថ្ងៃ​ទី​៣ ខែ​មករា ឆ្នាំ​២០១១ ត្រូវ​បាន​តែងតាំង​ជា​មេបញ្ជាការ​រង​នៃ​បញ្ជា​ការដ្ឋាន​កងទ័ព​ជើង​គោក​នៃ​កង ​យោធពល​ខេមរភូមិន្ទ។ Hun Sen (L) and his son Gen. Hun Manet. A Committee on Human Rights of parliamentarians from 162 countries has proposed a draft resolution stating that the criminal convictions against Cambodian opposition party leader Sam Rainsy are politically motivated, and that his participation in July’s national election is necessary if he vote is to be considered free and fair. The Governing Council of the Inter-Parliamentary Union (IPU), an international organization of parliaments, which currently lists Cambodia as a member, is expected to adopt the resolution drawn up by its human rights committee. Read the full article here. About 50 women protested in front of the Royal Palace on Fri­day morning and handed in a petition to King Norodom Sihamoni, requesting his support in the case of jailed anti-eviction activist Yorm Bopha, whose request for bail was turned down by the Supreme Court earlier this week. The protesters said that a Royal Pardon from King Sihamoni is Ms. Bopha’s only chance to be freed from prison, and that they would continue to lobby the King for support until Ms. Bopha is released. “Please Samdech Sihamoni and Queen Mother [Monineath] help to release Yorm Bopha and please… help to intervene for the land [we lived on] as well,” protesters from the Boeng Kak community yelled for about two hours outside the palace, until Laing Cham­nap, the Royal Palace’s Cabinet officer, accepted their petition. “I will receive this petition,” Mr. Chamnap said. “I will hand it to my superior, but I’m not sure,” if King Sihamoni will receive the petition, he added. Song Srey Leap, one of the protesters, said the petition is only the first. “I hope that our petition will reach the King and Queen [Mother], and if it does not arrive with them, we will hand it in again and again until Yorm Bopha is re­leased,” Ms. Srey Leap said. In September, Ms. Bopha, a 29-year-old mother, was arrested for allegedly ordering an attack on two motorcycle-taxi drivers. Found guilty on the word of the two injured men, the Phnom Penh Municipal Court sentenced Ms. Bopha, a longtime anti-eviction activist, to three years in prison for committing intentional violence with aggravating circumstances. An unused railway line connecting Sa Kaew's Aranyaprathet to Cambodia's Poi Pet may be revived and developed as part of a high-speed train project that will connect Thailand with other Asean countries, Prime Minister Yingluck Shinawatra said yesterday. During the roaming Cabinet in the eastern provinces, Yingluck said Sa Kaew province has business potential and the government has included the province in the Bt2.2-trillion infrastructure development plan, which includes railways to connect Cambodia to cater to business growth in the region. The six-kilometre section has not been maintained for years, making rail travel to and from Cambodia impossible. The link is part of the 10 Asean countries' plan to build a regional railway network to connect with China. During her visit to Klong Luek checkpoint in Aranyaprathet district, Yingluck instructed officials to overhaul the immigration and customs system to reduce service time by up to two hours. BANGKOK — China’s expanding investment portfolio in Cambodia has brought into sharper focus the darker side of the Asian giant’s “development projects” in the impoverished Southeast Asian nation. And it is in the southwestern corner of Cambodia—known for its rich biodiversity, forest covered hills and bubbling rivers—where this Chinese economic footprint is leaving a defining mark. A plan to build a 400 km-long railway line through this rugged green terrain is the most recent Chinese addition to growing list that has alarmed Cambodian environmentalists. The new rail line will serve as a transportation corridor to link two other planned Chinese investments: a steel plant near iron ore deposits in the northern province of Preah Vihear and new seaport in the southern coastal province of Koh Kong. The steel plant will be a first in the country, where the only industry in a largely agrarian setting is the economically successful garments sector, which accounts for 75 percent of Cambodia’s exports, valued at US $4 billion annually. Two Chinese companies are spearheading these three ventures, valued at $11.2 billion — the largest foreign investment ventures in Cambodia’s history. This deal, signed at the dawn of the New Year, exceeded the total foreign investment the Chinese have poured into Cambodia over the past two decades, which had reached $8.8 billion by the end of 2012, according to the Council for the Development of Cambodia, the government’s investment agency. ចំណែក​អ្នក​​អាន​ម្នាក់​ទៀត​ដែល​ដាក់​រហស្សនាម​ថា «ខ្មែរ​ស្នេហា​ជាតិ» បាន​បង្ហើប​បន្ថែម​អំពី​តំបន់​ដែល​ចោទ​ថា ថៃ​រំកិល​ព្រំដែន​ចូល​ដី​ខ្មែរ ដោយ​សរសេរ​ថា ពិត​មែន​ហើយ​បង្គោល​ព្រំដែន​នីមួយៗ​ត្រូវ​ថៃ រំកិល​ទាំង​អស់។ ដូចជា​ច្រក​បឹង​ត្រកួន រំកិល ៣​ដង។ ច្រក​នីមួយៗ​តាម​ព្រំដែន កាល​ពី​មុន​មាន​ទំនប់ ឬ​ហៅ​ថា វ៉ៃយ៉ូ ឬ​លេនដ្ឋាន ហើយ វ៉ៃយ៉ូ នេះ នៅ​ចម្ងាយ​ពី​ភូមិ​តាប់ពីយ៉ា​ចាស់​ប្រហែល ៤០០ ទៅ ៥០០​ម៉ែត្រ ហើយ​ចំណុច​នោះ​មាន​ដើម​ស្នាយ​ធំ និង​មាន​ដំបូក​ទៀត​ផង។ បច្ចុប្បន្ន​អស់​លោក​បាន​ជ្រាប​ដែរ​ទេ? តើ​បង្គោល​នេះ​ចូល​មក​ក្នុង​ដី​ខ្មែរ​ប៉ុន្មាន​គីឡូម៉ែត្រ​ក្នុង​ទឹក​ដី​ ខ្មែរ? PHNOM PENH, Cambodia – The United Nations-backed tribunal trying former Khmer Rouge leaders for genocide says it will pay several months of overdue salaries for its Cambodian staffers. An announcement from the tribunal's administrative office received Saturday said the U.N. would provide funds covering January through April this year. It did not specify how much would be given. Foreign and Cambodian personnel are paid under separate budgets. Translators for the tribunal went on strike in early March over their pay complaint. They agreed to resume work after being paid their wages for December. The tribunal is tasked with seeking justice for atrocities committed by the Khmer Rouge during its 1975-79 reign, when an estimated 1.7 million Cambodians died from forced labor, starvation, medical neglect and execution. PHNOM PENH (The Cambodia Herald) -- The newly-elected President of the Sam Rainsy Party, Kong Korm, appealed to the Inter-Parliamentary Union, the European Union, the countries of Paris Peace Agreement and the United Nations to pressure the Cambodian government to pave way for the safe return of the exiled, Sam Rainsy, before the upcoming elections. The appeal was made Saturday, during the 16th anniversary commemoration ceremony for the victims killed and injured in the grenade attack on March 1997. The event was held in front of the former National Assembly site. Speaking through video conference from France, Sam Rainsy, President of National Rescue Party, said the last 16 years, unidentified suspect(s) threw four grenades into demonstrators who rallied to protest the Court of Justice, killing at least 16 and injuring over hundred others. He said, the terrorists haven’t been identified yet even though it was 16 years ago. The citizens are still waiting for their arrests. "I, Sam Rainsy in the name of the victims and their families, am committed to say that this will be the last commemoration that we will hold without receiving justice," he said. "And the situation in 2014 will be different." មេ​ប៉ុស្តិ៍​បរថ្មី ច្រក​អូរអែម សង្កាត់​បរយ៉ាខា ខេត្ត​ប៉ៃលិន ដែល​ត្រូវ​បញ្ឈប់​ពី​តួនាទី លោក មួន ទឹម ហៅ ញ៉ន (ស្ដាំ) អង្គុយ​ក្បែរ​បង្គោល​ឡាក់​លេខ ៦៤ កាល​ពី​ថ្ងៃ​ទី​១៩ មីនា ឆ្នាំ​២០១៣។ Mr. Mourn Tim, aka Nhorn, sitting to the right of border post no. 64 in Boriyakha district in Pailin province has been sacked for showing reporters about the Thai encroachments. រដ្ឋលេខាធិការ​ក្រសួង​ការ​បរទេស​កម្ពុជា លោក ឡុង វីសាលោ ផ្ដល់​បទ​សម្ភាសន៍​ដល់​អ្នក​កាសែត នា​ក្រសួង​ការ​បរទេស​កម្ពុជា កាល​ពី​ថ្ងៃ​ទី២៩ ខែ​មីនា ឆ្នាំ​២០១៣។. Mr. Long Visalo, Secretary of State of Ministry of Foreign Affairs speaking to reporters. WASHINGTON — Cambodian workers in South Korea say high wages there have helped their families back in Cambodia, but many here say they would rather work back home, under the rights circumstances. An estimated 30,000 Cambodians work throughout South Korean farms, factories and homes, earning far more than they could back in Cambodia. Workers in South Korea earn up to $2,800 per month here. But in interviews with VOA Khmer, workers say they were pushed to move thousands of miles away from family because there are not enough opportunities in Cambodia. Sithith Sovann, 34, who now works in Seoul, said he left Kampong Cham province to find work here. He appealed to the government to raise wages in Cambodia so that others won’t have to make such a move. 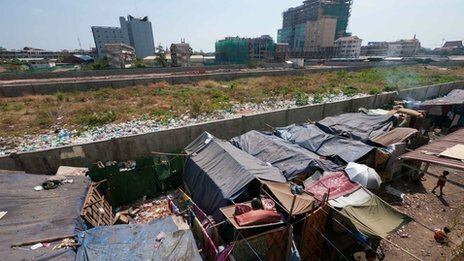 “We have to have enough to spend on the family,” he said in an interview with VOA Khmer. His salary was similar to that of many Cambodians in the workforce. The garment industry, which employs up to 350,000 people, has a wage of about $60 per month, though that is slated to increase to $80 per month. Workers often protest these wages, saying they have not kept up with the price of consumer goods. SA KAEO - Prime Minister Yingluck Shinawatra promised on Saturday to complete a missing rail link with Cambodia to foster closer ties with the neighbouring country. Ms Yingluck inspected the damaged tracks from Aranyaprathet district in Sa Kaeo to the border with Poipet in Cambodia and directed officials to speed up restoring the connection. The six-kilometre section has been left unmaintained for years, making rail travel to and from Cambodia impossible. The link is part of the 10 Asean countries' plan to build a regional railway network to connect with China. Ms Yingluck made the trip to Sa Kaeo ahead of a mobile cabinet meeting to be held in Chachoengsao on Sunday. The prime minister said she also supported the opening of the Ban Nong Ean checkpoint in Aranyaprathet district to connect with Ban Stung Bot in Banteay Meanchey province of Cambodia. However, she stressed that first the area must be confirmed as safe from landmines, which can still be found in the border area. PHNOM PENH — Cambodia could see less preferential economic treatment by Europe in coming years, as it graduates as a more developed country, the EU’s ambassador to Cambodia says. In an interview with VOA Khmer in Phnom Penh, Ambassador Jean-Francois Cautain said Cambodia currently enjoys tariff exemptions under a scheme called Anything But Arms, which seeks to promote trade with lesser developed countries. But Cambodia’s status under that scheme could change soon with its growing economy, he said. The threshold for a nation to meet Least Developed Country status is a per capita gross domestic product of $1,000. Cambodia is currently at $900, with an economy growing nearly 7 percent per year. Cautain said other factors, such as a country’s openness and human capital also influence its status. However, Cambodia’s economy is heavily reliant on garment exports to the EU, which accounted for more than $1.2 billion, or 25 percent of its exports, in 2011. If the country lost its trade preferences, its products would be less competitive, “posing burdens on its single-export economy,” the ambassador said. A changed status could also affect aid to the country, he said. Starting from 2014, the EU will focus its aid on Least Developed Countries. In Southeast Asia that would be Burma, Cambodia and Laos, mostly, he said. “So if Cambodia upgrades to a non-LDC country, we will review our cooperation with Cambodia,” he said. 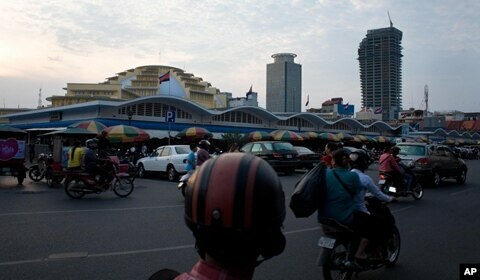 ​​Cambodia could also find new agreements with the EU in the future, Cautain said. “Could be a free trade agreement, such as what we are negotiating with Vietnam.” But a new agreement would not be as beneficial as the Everything But Arms scheme, he added. PHNOM PENH (The Cambodia Herald) -- Lawmakers from the Sam Rainsy and Human Rights parties, gathered Saturday to commemorate the 1997 grenade attack, 16 years ago, that killed at least 16 people and injured over 100 others. The lawmakers from the opposition parties that attended the ceremony, north of the Royal Palace, were Kong Korm, newly-elected Sam Rainsy Party President, Pol Horm, senior official of the Human Rights Party and Kem Sokha, vice President of National Rescue Party, as well as other members. The families and relatives of the victims killed in the attack on March 30, 1997, also attended the ceremony. They called for the arrest and sentence of the murderers. Boeung Kak Lake resident Yorm Bopha (C) reacts after she was denied bail at a hearing in the Supreme Court in the capital city of Phnom Penh on March 27, 2013. Boeung Kak Lake resident Yorm Bopha (L) gestures to her supporters as she attends a hearing in the Supreme Court in Phnom Penh on March 27, 2013. (New York) – The Cambodian Supreme Court’s decision to uphold the trumped-up imprisonment of a land-rights activist should prompt Cambodia’s donors to demand her unconditional release, Human Rights Watch said today. 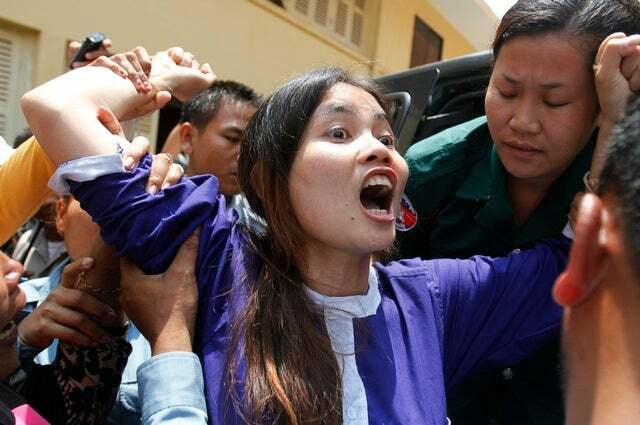 On March 27, 2013, the Cambodian Supreme Court denied bail to Yorm Bopha, who was imprisoned in December 2012 after receiving a three-year sentence on apparently politically motivated charges for protesting government land grabs that have adversely affected 700,000 Cambodians. On March 19, with Bopha’s appeal pending, Prime Minister Hun Sen gave a speech in which he declared Bopha’s sentence a “simple case of her beating someone up,” for which she had properly been criminally convicted. The Myanmar microfinance unit of Cambodia largest bank, ACLEDA, has started offering loans in 15 townships of Yangon Region at a monthly interest rate of 2.5 percent, , ACLEDA MFI Myanmar CEO Kim Bunsocheat said. The company opened its new office in Yangon’s Bahan township on Monday, saying it has eight billion kyats (US$10 million) in initial paid up capital. It said it had trained 36 Myanmar staff last year and that it planned to hire 740 university graduates. Kim Bunsocheat said loan sizes would start at 100,000 kyats and that borrowers would need two to five guarantors and official identification to be considered. ACLEDA is the largest bank in Cambodia by branch numbers. It has 238 branches in the country. It also has 29 branches in Laos and has announced plans to expand into China. A federal judge ruled Friday that the United States government has enough evidence to move forward in court with its effort to seize a 10th century Cambodian statue that Sotheby’s had hoped to sell for $3 million. The auction house had asked United States District Court Judge George B. Daniels to dismiss the case. The judge issued no opinion on the fate of the statue, but said the United States attorney for the Southern District of New York could add new information to original claims that Sotheby’s tried to sell the statue in violation of Cambodian law. Sotheby’s had argued among other things that the federal lawyers had failed to provide evidence that Sotheby’s knew the statue was stolen. Sotheby’s said it still expects to prevail at trial. សាកគិតទៅមើលបើសិនជាបរទេសមិនឲ្យជំនួយឥតសំណងជិត ១ពាន់ លាន់ដុល្លាក្នុងមួយឆ្នាំ និងខ្ចីចិន​បន្ថែម​ពី៥០០ ទៅ១០០០ លានដុល្លា ក្នុងមួយឆ្នាំទេ តើប្រទេសខ្មែរអាចរស់បានដល់សព្វថ្ងៃដោយ របៀណា ក្រោមការដឹក នាំរបស់ ហ៊ុន សែន? ហើយសាកគិតពីការកសាងស្រុកបស់សម្តេចតាទៅមើល ខុសពី ហ៊ុន សែន ដូចម្តេចដែរ? ខ្មែរមានជំពាក់ លុយគេទេ? ខ្មែរមានអ្វីខ្លះ? មានគេជួ យរាល់ឆ្នាំរាប់ពាន់លានដុល្លាដូចសព្វថ្ងៃទេ? សម្បត្តិធម្មជាតិវិញ នៅ គង់វង្សដែរទេ? 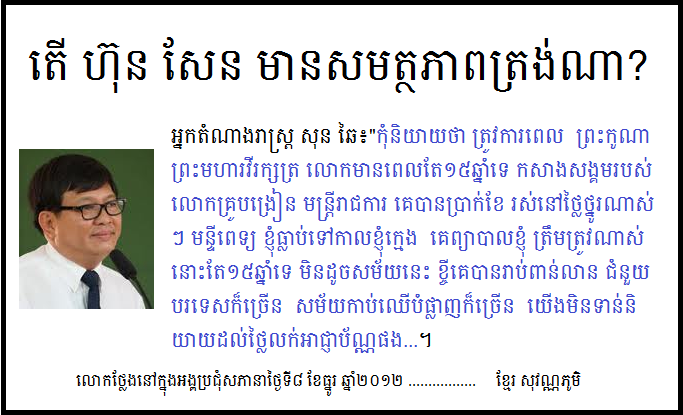 This was what MP Son Chhay had said about the two regimes: "Don't say that we need time (to develop), King Father Sihanouk had only 15 years to build up our society. The teachers, the civil servants had a decent salary on which they can live with dignity. I used to visit hospitals when I was young and they treated me very well. That's 15 years (of developments). Unlike now, they have borrowed billions of dollars and also received huge amount in foreign aid, this is a regime that destroyed (sold) huge forests and this we didn't even talk about (the revenue from) the sales of (business) licences yet". Cambodia probably lost lands to three neighbours! First, I am not a supporter of any party. In my research and personal opinions, I found out that we probably did lose our territories to our three thieving neighbors. Cambodia was too busy killing each others and there was no one to keep an eye on our borders with the neighboring countries. Our country's military was so weak and disorganized and that's why Siam (Thailand) and Youn (Vietnam) took advantages of this great opportunities. Siam moved border posts where the Khmer Rouge, the KPNLF and the FUNCINPEC resistance forces had withdrawn after the 1991 Paris Peace Agreements, leaving a void at the border areas. The current Cambodian government knew this happening at western, eastern and northern borders but was powerless to control these situations because there was no budget, no political will, no man powers and no back up to confront these thieving neighbors. Cambodia only had an opportunistic allies, but never had a real friend. I believed that the border posts that Siam had moved will only be temporary, if Cambodia had competent border negotiators. In these modern days where we had GPS and Navigators, there is little that Siam can manipulate. We need a government to draw a line that we Khmers will tolerate NO MORE the expansion into our country. 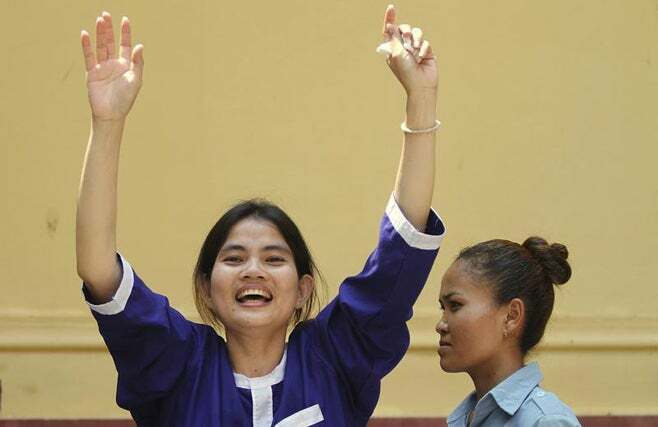 Tep Vanny raised hands in defiance after she was released from prison on 27 June 2012. Beoung Kak lake resident Tep Vanny beat out 10 international activists to win a human rights award as part of the Movies that Matter Film Festival in The Hague on Wednesday night. Vanny, 32, who has been imprisoned, beaten and threatened during years of protesting against land evictions, was a protagonist in the documentary Even a Bird Needs a Nest, which led to her winning the Amnesty International-sponsored 5,000-euro Golden Butterfly: A Matter of ACT Human Rights Award. “I wish to thank the jury for its choice, but I cannot be happy when I know that my community continues to struggle for justice,” she said, according to the blog of opposition lawmaker Mu Sochua, who attended the ceremony. Civil society criticise the government for threatening Radio Free Asia. Prime Minister Hun Sen yesterday issued extensive orders to unions, factories, workers and authorities to rid the garment industry of violent strikes, roadblocks and rights violations he says are threatening public order. “There have been many strikes and demonstrations at factories recently, and, in some cases, it’s led to violence and public and private property being destroyed,” Hun Sen said in a statement. Unions, the prime minister added, must stop forcing workers to strike; factories need to improve working conditions and respect ILO conventions protecting workers’ rights; and government ministries should provide better mediation and policy to prevent strikes. The prime minister also became publicly involved in labour issues last week when he insisted an extra $2 be added to a proposed $12 hike in the $61 monthly minimum wage. The Labour Advisory Committee is expected to rubberstamp an increase to $75 today. ‘I heard a f—ing crazy dog say that we can’t dock in Kampong Saom, but we definitely can do that,” a crackling voice declares boisterously. The speaker, captured in video obtained by the Post, is part of an illegal timber syndicate. As he brags about selling timber to people he refers to as “long nose”, Khmer slang for foreigner, he parades around a timberyard filled with container after container packed with luxury wood. Posing in front of an open container of what is identified as either luxury Thnuong or rosewood logs, a man referred to as the owner, beams with a greedy smile. “The most important thing is that everything is agreed from there, when [it] arrives here, they will take all [varieties],” a voice says. There are at least 37 container loads – hundreds of thousands, perhaps millions of dollars worth of illegally logged timber in the yard. The identity of the speaker is unknown and he could be anywhere in the country – indeed, this type of luxury wood harvesting is happening all over Cambodia. But nowhere is it more blatantly visible than along the national roads, endlessly lined with rubber plantations, that bisect the northeastern provinces of Kratie, Mondulkiri and Ratanakkiri. From the sky, it is clear that the multi-million dollar timber trade has already decimated Kratie’s 75,089 hectare Snuol Wildlife Sanctuary. Imagery from two of NASA’s Landsat satellites compiled by the Post from photos snapped between 2009 and 2013 suggests that about 60 per cent of the entire sanctuary’s evergreen forest has become cleared land. Although anti-trafficking group SISHA last Friday said beatings were among the serious complaints leading to the removal of 21 children from the Love in Action orphanage in Phnom Penh, police said yesterday that they were aware of just one minor instance of physical abuse at the orphanage by a low-ranking staff member. The fact that children were squabbling over food was more indicative of the reasons for the intervention, which included poor management and the orphanage’s unregistered status, he said. “Therefore, she forwarded her children to the social affairs department . . . We have no information about human trafficking in the orphanage,” he added. Pithey said that whether the orphanage could be reopened was up to the Ministry of Social Affairs. Ministry officials could not be reached for comment yesterday. JAPAN-BASED Terra Motors Corporation viewed Cambodia as a potential market for its electric tuk-tuk, the company’s general manager of overseas sales said yesterday. “We’re thinking of entering the Cambodian market as well. But at this moment, there are no concrete plans. [We] just hope to enter,” Kota Kandori told the Post. Terra Motors’ e-tricycle, powered by a lithium battery, can reach a maximum speed of 50 kilometres an hour. And, with a length of 3.3 metres, it can accommodate six passengers. According to Kandori, Terra Motors is thinking of selling the electric trike for about $3,000. “We have never been to Cambodia, but I think fuel costs are high and there is some air pollution,” he said. “So if you’re using our three-wheeler as a taxi, the fuel costs are one-quarter of those of a petrol one, and with zero emissions. PHNOM PENH (The Cambodia Herald) -- Foreign Minister, Hor Namhong, will lead government officials to attend the hearings at the International Court of Justice (ICJ) in Hague, Netherlands. The ICJ will conduct a hearing on the Preah Vihear Temple case from April 15th to 17th following a complaint by Cambodia. Long Visalo, secretary of state at Ministry of Foreign Affairs and International Cooperation, told reporters Friday, government officials who will attend the hearing are Hor Namhong, Va Kimhong, senior minister in charge of the Cambodian Border Affairs Committee, and four experts and lawmen. "We have strong documents to present to the court," he said. "We will use these documents as evidence to defend Cambodia in the oral hearing." Cambodia filed a complaint on May 2011, following the occupation of Thai soldiers around Preah Vihear Temple in Preah Vihear province. UNISCO listed Preah Vihear temple as World Heritage site in 2007. Has Cambodia become a country for sale? Phnom Penh, a city once fabled for its stately colonial buildings and boulevards, and its serene riverside setting, is becoming a city of glaring contrasts. An economy left in ruins by the years of war and violent revolution in the 1970s and 80s grew at a rate of almost 10% a year from 1998 to 2008. Cheap land, cheap labour and rich natural resources have attracted big inflows of foreign investment, especially from Asian neighbours like China, Vietnam and Thailand. That has ignited a property boom. For the first time in its history Phnom Penh's skyline is being pierced by modern high-rise towers, offering new office space and luxury apartments. Land prices are soaring, and developers are constantly seeking out new possibilities for construction. One area they targeted was the city's largest lake, Boeng Kak. A company owned by a senator from the ruling Cambodian People's Party, Shukaku, was given a 99-year lease to drain and build on the lake in 2007. Another was the centre city neighbourhood of Borei Keila, which another politically-connected company, Phanimex, was given the right to develop in 2003. But there was a problem. People already lived on this land. Like most of Phnom Penh's residents, they had moved to the city after the fall of the radical Khmer Rouge regime, which had emptied Phnom Penh in 1975, and following the decade of civil war in the 1980s. They did not have land titles; very few people do in Cambodia, as the Khmer Rouge abolished private property and nearly all documents were destroyed. So the state claims to own more than 80% of Cambodia's land. That gives the government the final say over who gets to develop it. The bulldozers moved in to start demolishing the flimsy houses around Boeng Kak lake in 2008. There have been clashes with local residents ever since. Some have been beaten by riot police as they tried to block the developers, other have been arrested and charged. Many of them are women. 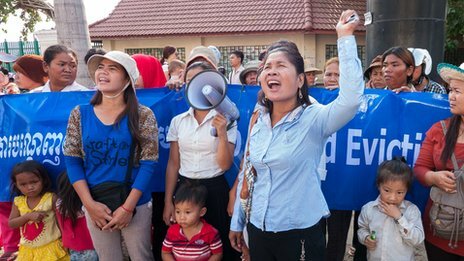 One of them, 31 year-old Tep Vanny, has become the leader of the women who are still protesting against their treatment by the company. A passionate and outspoken mother of two, she and her husband were previously evicted from land they lived on in Kampong Speu province near Phnom Penh, and moved to Boeng Kak in 2004. Taiwan Cooperative Bank, one of the leading banks in China's Taiwan, officially commenced business in capital Phnom Penh on Thursday, bringing the number of commercial banks in the kingdom to 33. Taiwan Cooperative Bank is the 2nd bank from China's Taiwan in Cambodia after the Mega International Commercial Bank opened its door in September 2011. Speaking at the ceremony, Ouk Maly, vice-governor of the National Bank of Cambodia, said that the presence of the bank in Cambodia reflected foreign investors' confidence in the country's banking industry. 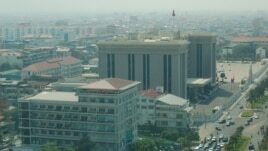 "New bank will bring new sources of capital, new hi-tech banking solutions, and new employment to Cambodia," she said. " Through the bank, I believe that more investors from Taiwan region will come to Cambodia for business opportunities." Ling-long Shen, chairman of the Taiwan Cooperative Bank, said that this was another success after the bank opened its Sydney branch in September 2011. "Our overseas branches reflect our determination to move into the international financial market," he said. He said the bank's decision to enter Cambodian market was thanks to the country's political stability and sound economic growth. Ha Noi - Travelers bound for Cambodia can now take direct flights from Ha Noi to both Phnom Penh and Siem Reap via new routes launched by Cambodia Angkor Air. Yesterday, the airline also kicked off a four-day promotional tour from Ha Noi - Phnom Penh - Siem Reap, offering travelers a VND9.2 mln (S$521) package deal, VND2,5 mln lower than the normal cost. The tour starts every Thursday. Along with the official opening of a representative office in Ha Noi late last month, Angkor Air also announced direct flights Phnom Penh - Bangkok and Siem Reap - Bangkok, with rates starting at $59. Cambodia is one of the world's newest and most exciting destinations, boasting the world-famous Angkor Wat complex and the beach resort of Sihanoukville. The forthcoming visit of Cambodian Prime Minister Hun Sen to China early next month will bring deeper relations and cooperation between the two countries, Cambodian Deputy Prime Minister and Foreign Minister Hor Namhong said Friday. During a meeting with Shen Peiping, vice governor of China's Yunnan province, Hor Namhong said that Hun Sen will visit China in April 6-10. During the visit, the leaders of the two countries will sign an action plan in order to implement the Comprehensive Strategic Partnership of Cooperation, which was established in 2010. Also, the two governments will set up an inter-governmental committee in order to monitor the implementation of the Comprehensive Strategic Partnership of Cooperation. He recalled that the long-standing friendship relation between Cambodia and China was founded by Cambodia's late former King Norodom Sihanouk and former Chinese leaders and the tie has become stronger because the leaders of the two countries have continued to maintain and further enhance from generation to generation. Cambodia and China last year vowed to double the bilateral trade volume to 5 billion US dollars in 2017. According to the official figures, the bilateral trade volume valued at 2.9 billion US dollars in 2012, up 16 percent year-on-year. Hor Namhong said that based on the figures, it will not be difficult for both sides to achieve the target in 2017. Sam Rainsy speaks at RFA in Washington, DC, Nov. 1, 2012. A group of parliamentarians from 162 countries is studying a resolution calling on the government of Cambodia to drop a conviction against opposition leader Sam Rainsy and allow him to return to the country to contest national elections in July. The Committee on Human Rights of Parliamentarians in the Geneva-based Inter-Parliamentary Union (IPU) proposed the resolution on Wednesday. Sam Rainsy, 63, a former lawmaker, was convicted and ordered jailed in 2009 for the removal of a temporary post demarcating Cambodia’s border with Vietnam. Together with other convictions he said were part of a campaign of political persecution, he faces up to 11 years in prison if he returns to Cambodia from exile in France. 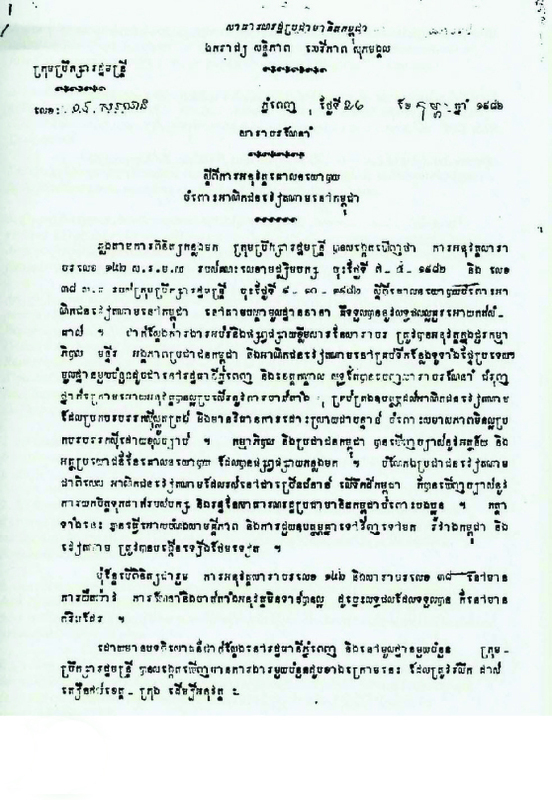 “The information [government officials] provide does not dispel [the IPU’s] long-standing concerns that Mr. Sam Rainsy’s removal of temporary border markers was a political gesture and that, consequently, the courts should never have been seized of the matter in the first place,” the proposed resolution said. Richard Baker of the Age newspaper said in an email that Hun Sen is worried about allegations of corruption he wrote in the Age. Hun Sen's directive is basically to ask local authority to facilitate the settlement and the livelihood of Vietnamese immigrants by providing land for them to build their homes and make a living.